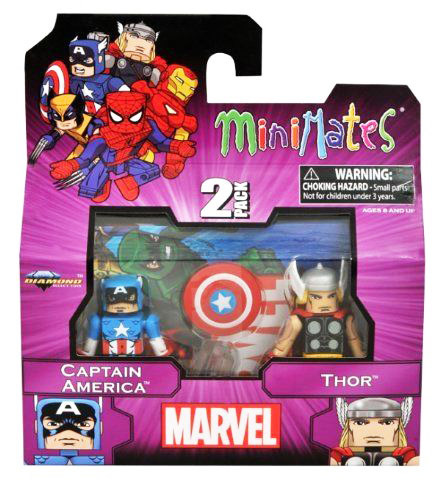 Marvel Minimates have been around for over a decade, and Diamond Select Toys has made hundreds of different characters, but at the end of the day, everybody wants a Minimate of their favorite hero or villain. So for those of you just getting into Marvel Minimates, or simply looking for the best version of a Marvel icon, DST presents a "Best of" wave of two-packs: Wolverine and Sabretooth, Spider-Man and Green Goblin, Captain America and Thor, and Iron Man and Thing. A great jumping-on point for any collector or retailer! Each Minimate stands 2" H with 14 points of articulation and a variety of removable and interchangeable parts and accessories.